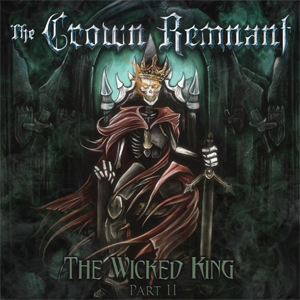 Los Angeles-based five-piece THE CROWN REMNANT have released their new album, The Wicked King: Part II, available now via Amazon, iTunes, Google Play, Spotify and Bandcamp! The Wicked King: Part II, takes the listener on a dramatic, energetic joyride from start to finish! In celebration of the album release, THE CROWN REMNANT have revealed a brand new music video for the epic track "Legacy", in which the band shows off their acting chops! Watch the music video on KNAC.COM HERE. Lead vocalist Geordy Shallan says, "Our guitarist Will came to me with the idea for the video and a shot list, and from there we figured out everything - down to the size of the crown - in about a day. After that, we brought it to Matt Polizzi, our dear friend and former DP and director for "From Damnation to Deliverance". He loved the concept, and jumped right on board. He and Will co-directed it, which gave the video a much different personality than our older videos. And with that, we were able to tell the beginning of the story of The Wicked King himself in our own special way - that is, with a comedic tinge! We really wanted to showcase that even though we're very serious musicians, we love the opportunity to sit back and laugh at ourselves. And with everybody dying the ways we do, I think we achieved exactly that." THE CROWN REMNANT have mastered the art of melodic, theatrical, yet hard-hitting heavy metal, and the world is about to take notice. Combining a variety of metallic influences ranging from modern metalcore and prog, thrash and more, The Wicked King: Part II acts as the second part of the band's previous release, The Wicked King: Part I. Within the first month of its release, THE CROWN REMNANT garnered over 10,000 streams of their first single cut from The Wicked King: Part I, entitled "Haunted". The band plans to follow suit and beyond with The Wicked King: Part II. The Wicked King: Part II is loosely based on thematic concepts of oppression and tyranny. Originally recorded as one long album, the band decided to split it into two releases - with The Wicked King: Part II acting as the "darker" side of the two. Part II addresses tales of betrayal, mortality, exploring the afterlife and more. Intertwined within these ideals are scattered lyrics pertaining to the character designed on the front cover of the album: The Wicked King. He remains an everlasting shadow of a forgotten king set on immortality, with his insatiable lust for never-ending life.